Roger Dean Complex, Cardinals Field 2, Jupiter, FL – The battle of Caracas, Venezuela, was waged on an auxiliary baseball diamond in Jupiter Florida, and 25-year-old Miguel Vargas made sure his Piratas de Venezuela were victorious. 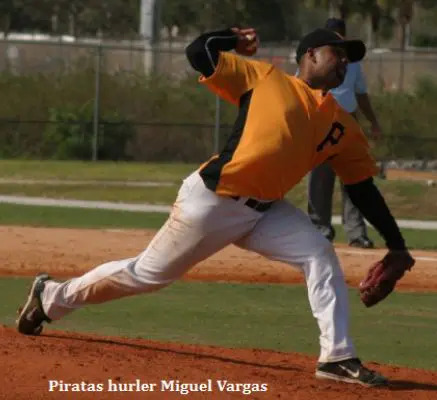 Vargas placed his Venezuelan teammates on his back with a complete game shutout as the Piratas de Venezuela defeated the Nacionales de Venezuela 6-0 for the 25 Central title. Vargas, pitching his second game of the tournament, was in total command from start to finish and Manager Javier Anton couldn’t have been happier. “He was our best pitcher from the start of the tournament and he was the one I wanted to pitch in the championship,” said Anton. The fireballer and tournament MVP struck out 13, walked none, scattered five hits and never lost steam off of his fastball. “I felt very strong, and comfortable the entire game, and could have pitched more if they needed me to,” said Vargas. The game was scoreless heading to the bottom of the second inning as the first nine batters of the game retired, but the Piratas cleanup hitter German Rostery greeted Nacionales starting pitcher Alex Bravoa with a leadoff double. He eventually scored when team captain Marvin Flores hit a towering sacrifice fly ball to deep center field as Rostery trotted home with the game’s first run. “I try to lead the team by example and wanted to make sure that I scored the run,” Flores said following the game. The way Vargas looked on the mound everyone seemed relieved to have scored first. “Everyone seemed to relax after that first run, as we were confident Miquel was having a good day on the mound,” Anton said. The pitcher himself was excited that his teammates scored the early run. “I was even more confident than when the game started,” said Vargas. If he was confident then, one can only imagine how he felt after the bottom of the fourth inning. The Piratas sent nine batters to the plate that inning with the help of four walks and a hit batter. With the score 3-0 score, Bravoa served up a three-run double to right center by Servio Castillo and the lead was suddenly 6-0. Maycoll Nunez, who served as the interpreter for the media, said “everyone was relieved after Servio’s hit as we felt we could win the title right there.” The mood became festive in the dugout as the team started chanting with every batter. “This is what we had all hoped for when we arrived at the tournament,” said Anton. The road to the championship was shaky first as the Piratas held off Lukes de Venezuela 13-12, en route to a perfect 5-0 record in pool play. They won 7-6 in the semi-final over Athleticos de Venezuela. Things weren’t quite as easy for the Nacionales, who lost their opening game of the tournament before winning the next four games. They beat Lukes de Venezuela 8-1 in the opening playoff round to set up the matchup with the Piratas. Ironically, the Piratas and Nacionales, who play in the same league in Caracas, were a three hours flight and about 1,400 miles from Caracas. Despite the level of intense competition on the field, most of the players are friends. There were genuine hugs and handshakes after the game, with opposing players taking pictures with one another to commemorate this sunny afternoon in Florida.